Since the girls are currently on Spring Break, we decided it would be a good time to take the family on a little vacation. My father-in-law has been spending a lot of time in San Antonio lately on business, and he suggested that we all go out to see the city. We spent this past weekend there and had such a blast! The city has everything: culture, history and of greatest importance to me, delicious food . 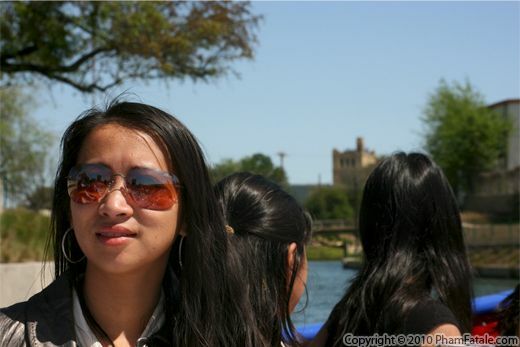 It was my first visit to Texas. I was pleasantly surprised by the rich heritage of the state. We arrived very late at night in San Antonio but we couldn't resist taking a stroll along the Riverwalk. The city was alive even at midnight. We passed by a Hard Rock Café, several bars and Mexican restaurants. We eventually stopped for some Haagen-Dazs ice cream. The nightlife in San Antonio is amazing and incredibly romantic. Lulu and I were holding hands, enjoying ourselves. The energy reminded me of the French quarter in New Orleans, but less touristy. 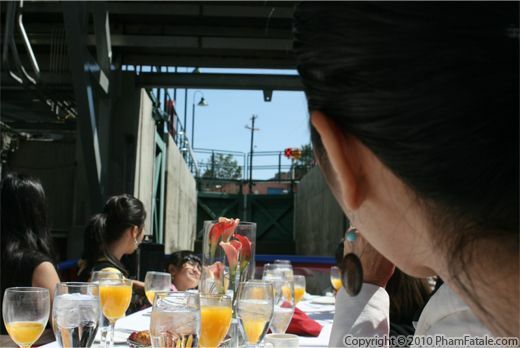 The next morning, we met some of Daddy's friends and took a tour of the river on a barge. They served brunch, which was just wonderful. It was so nice, eating fresh fruits, granola, yogurt, cookies and pastries, all while enjoying the wonderful architecture (historical buildings and elegant hotels) as we floated by. The best part though was the lovely company. We had an absolute ball. Later that day we visited the Alamo. It's a beautiful structure that is obviously steeped in history. We listened to a docent give a very informative talk on the history of the Alamo. We then headed back to our hotel to freshen up before dinner. At one of the hotels, we received a basket full of Texan specialties. 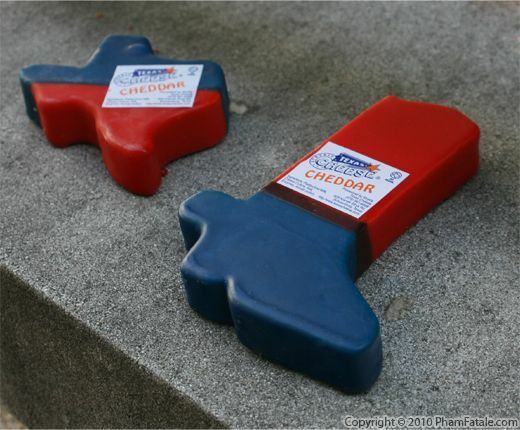 The ones pictured are jalapeño cheddar cheese. I've heard so much about Tex-Mex cuisine over the years that I really wanted to give it a try while we were in San Antonio. 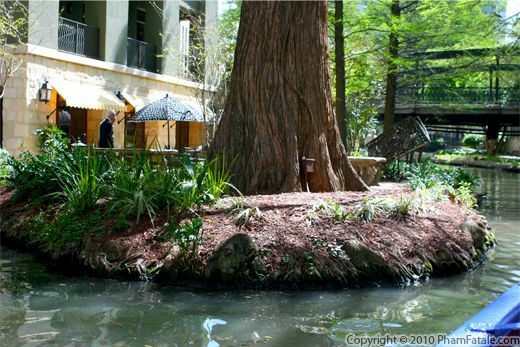 To that end, we went to a restaurant along the Riverwalk that turned out to be really, really bad. 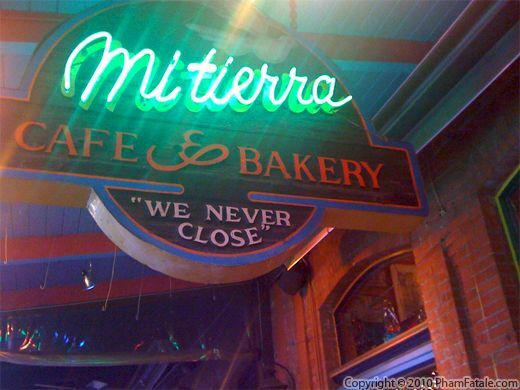 I was beginning to think that perhaps Tex-Mex was a bit over-hyped, but then the next day we were treated by one of Daddy's friends to some of the best Mexican food I've ever had at a San Antonio institution called Mi Tierra Café. 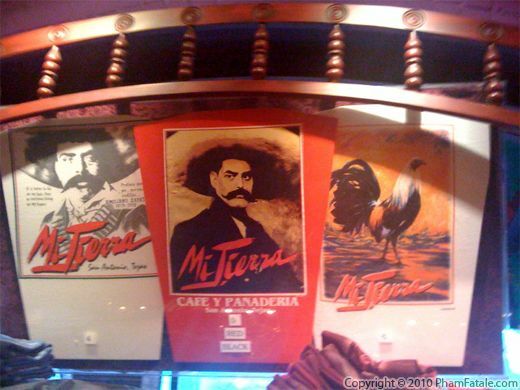 "Mi Tierra Café" Owner David Cortez. 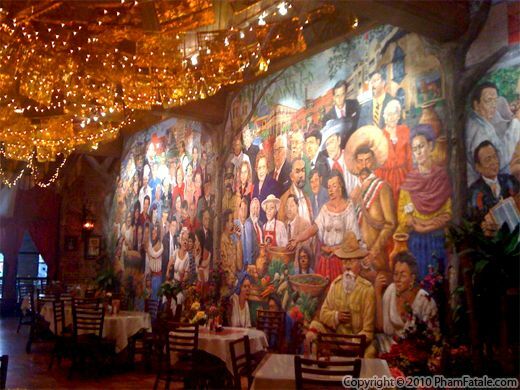 Located in El Mercado, Mi Tierra is a 70-year-old restaurant that is open 24 / 7, 365 days a year. 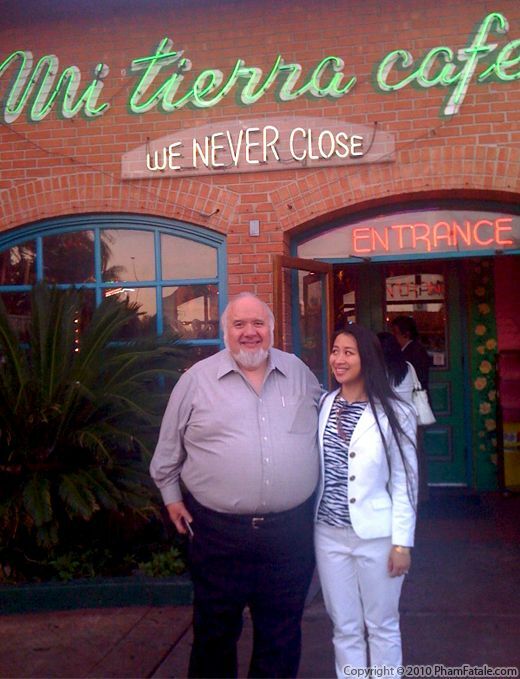 We received a warm welcome from the owner, David Cortez, who also gave us a tour of the restaurant. The bar is magnificent, with murals of famous locals and patrons. 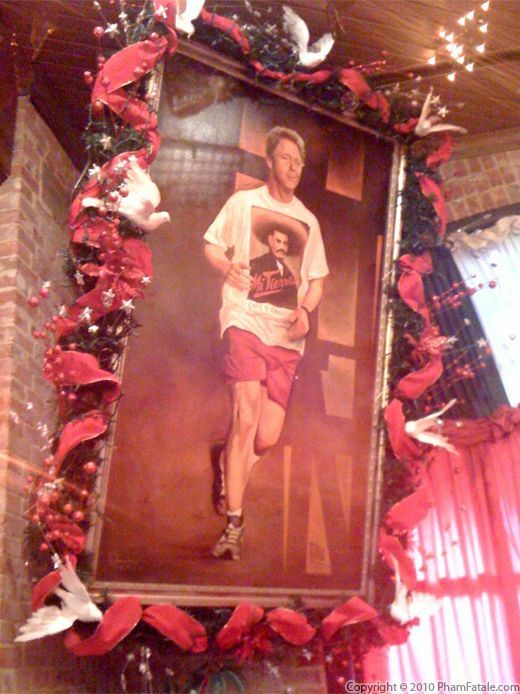 I also noticed a large painting of President Clinton, jogging. He looks a lot thinner in the portrait than he does now! The food was uniformly delicious. It's obvious that the chefs pay very close attention to detail. The salsa, guacamole and cheese dip were fabulous, and basically a meal in and of themselves. We were all pretty full by the time the main courses came around. The kitchen was extremely accommodating of the vegetarians in our family. They all had cheese enchiladas with rice and vegetables. Even after noshing on all those chips, Lulu polished off his entire plate and told me they were the best enchiladas he's ever had. I had chicken fried steak fajitas that were absolutely divine. Even though we were all so full, we managed to squeeze in some dessert. We had an ultra-moist, tres leches cake topped with cream and fresh fruits. It was really decadent, but my little munchkin managed to finish two slices. We would never have found this place on our own, which just reinforces the fact that if you really want to find the best restaurants around, you have to ask the locals. Los Trovadores: During the meal, we were treated to some songs from the restaurant's mariachi band. 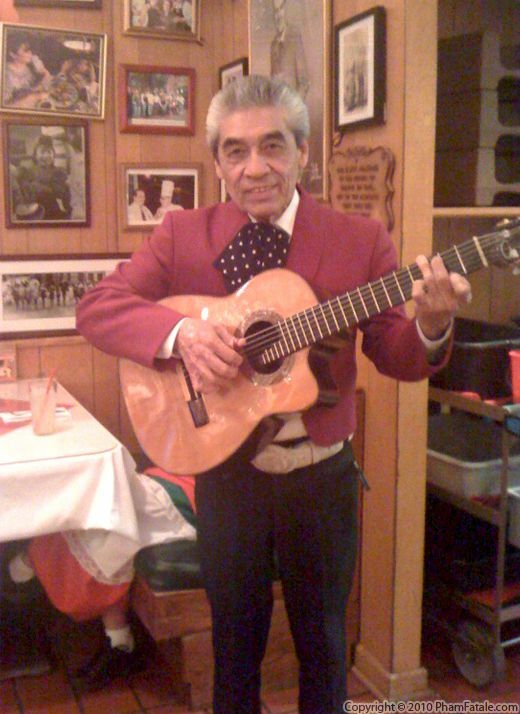 One mariachi (the one pictured) has been playing for 50 years!! 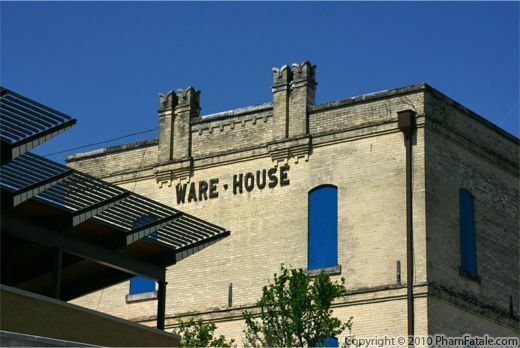 San Antonio is one of the fastest growing cities in America: vibrant, bustling and full of life. 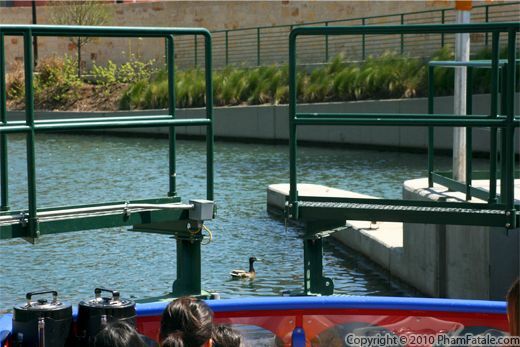 If you're looking for a destination for your next vacation, give San Antonio a close look. And if you're lucky enough to be in Texas this month (April), don't miss the City Fiesta. You'll have a wonderful time! My little munchkin brought her teddy bear and let it borrow her eyeglasses so her little stuffed friend could see the city with her. Little munchkin named the bear "Martha"; she recently made it at a Build-A-Bear Workshop.